The wonder of the natural world has motivated me for nearly as long as I can remember. At age 5, I wandered across the country road in front of our family farmhouse to peer into an eastern hardwood forest. The sunlight filtering through the trees, the mystery of the forest depths—it all left an indelible impression. We were living in Canada because my father, Jerry Williams, was coaching the Hamilton Tiger Cats, the last major stop on his twenty-five year career in professional football. My mom, Marian, was managing the 16-acre fruit orchard that came with the place. She and my sister, Julie (the nearest of four siblings and eleven years older—I’m the baby), drove our GMC Pacer from Ontario, Canada, to Arizona, with me in the back seat mesmerized by the ever expanding views. Football was over, for now. We were going to live on a ranch. The year was 1976. Ranching life only lasted a few years, but by then I’d seen my first rattlesnake, and visited a dilapidated miner’s cabin surrounded by tall pines. I thought I might live there, an 8-year-old hunkered in the high country. Instead, we moved into the suburbs of Prescott, Arizona. The chaparral countryside kept me entertained enough, dashing between the scrub oak as if I were a phenom running back. But a knee injury kept me from pursuing college football, and at Northern Arizona University, I studied geography. My academic education waned but my interest in real landscapes blossomed. I took a summer job slinging salmon in Alaska, and then got an opportunity to learn river guiding through my cousin Mary, who co-owned Cascade Raft Company on Idaho’s Payette River. After a year of guiding, I probably wouldn’t have returned to NAU for my junior year anyway, but when a private Grand Canyon trip was offered that Fall, the deal was sealed. I was now a river guide. The early 1990s took me on the guiding circuit; Payette River, Salmon River, Rio Grande, Gauley, Chattooga, Lochsa (say lock-saw). I fell in love with a woman named Lisa. She was a gnarly kayaker. After a couple years of chasing her down rapids, I was a decent kayaker too. So my focus in life became whitewater kayaking. I wanted to paddle every wild river there was, and if there was a blue line on the map that nobody could tell me about, I wanted to go there even more. This led to twenty-something first descents. I still add to that total occasionally. The sense of exploration fires me up, some vestige of our ancestors who wandered across the continents. That drive to explore brought me back to Arizona in my late twenties, so I could explore the state’s many canyons. A Jon Krakauer article introduced me to canyoneering, which was hardly even a thing at the time. But I sensed it would be, and someone was going to write an Arizona guidebook for it. I figured that someone should be me. I guess I’d inherited some of my father’s competitiveness. Canyoneering Arizona came out in 1998, the same year Lisa and I married. The book was a big success, so I did another one, called Grand Canyon River Hikes. Grand Canyon has been important to me since my first hike there at age ten. Now, I guide youth groups in the Canyon. I think it is the most amazing landscape on earth, and I wander it’s depths whenever I can. It helps anchor me in Flagstaff, Arizona. But it’s the state’s other natural wonders which I’ve spent much of my life exploring, and I’ve tried to feature that terrain in my other Arizona guidebooks—Arizona Summits (two books—North and South), and Paddling Arizona. That one was a labor of love, the culmination of an obsessive paddler living in the desert Southwest. 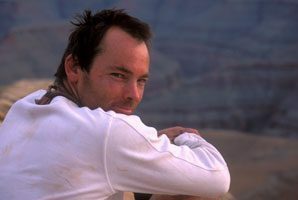 Before Paddling Arizona, I wrote Whitewater Classics, which took me to the best whitewater rivers of North America. That book got me a gig with Kayak Session magazine, where I profiled the most interesting and influential whitewater kayakers in history. I’ve now written over 100 articles for a handful of different magazines including Canoe & Kayak, Arizona Highways, and American Forests. The American Forests stories often have me seeking big, record-size trees in primeval forests, another of my favorite fascinations. My most recent guidebooks are about big trees. To reach some of those giant trees, I’ve had to hike, and then pack raft down wild river canyons. This sort of diversity in backcountry travel appeals to me, which is why I’m also drawn to river journeys that travel from source to sea. My first source-to-sea trip was the 800-mile long Fraser River. I used a pack raft, whitewater kayak, and touring kayak. For the Salmon-Snake-Columbia (a 970 mile trip), a sea kayak and a canoe with a 3-horsepower motor were added to the mix. I’ve also traveled the entire Klamath River, and several shorter rivers from headwater spring to ocean mouth. It’s always an amazing experience. I keep lists of things: 340 river segments, 145 backpacking trips, 93 Oak Creek runs, 28 Grand Canyon river trips, 9 elk hunts; I have basic notes for all of them. Sort of geeky, I know, but it helps me remember things, which is sometimes fun. If I can’t be doing something, I like to be planning something, and if I can’t be planning something, I enjoy reflecting on something. Reflecting on things, writing about adventures, documenting the wild wonderful world in photographs; all of this has helped me earn a living over the past decades. If you have read one of my articles or blog posts, or bought one of my books—Thank You. You are a part of this funhog’s journey.